Samantha Whitney Jones tainted breast milk: Could baby death have been prevented? Home Scandal and Gossip Drug addict mom kills baby with tainted breast milk. Drug addict mom kills baby with tainted breast milk. Pictured, Bucks County, Pennsylvanian woman, Samantha Whitney Jones. Police Bookings. Samantha Whitney Jones a New Britain, Pennsylvania woman and drug user is charged with murder after breastfeeding her baby infant tainted milk. 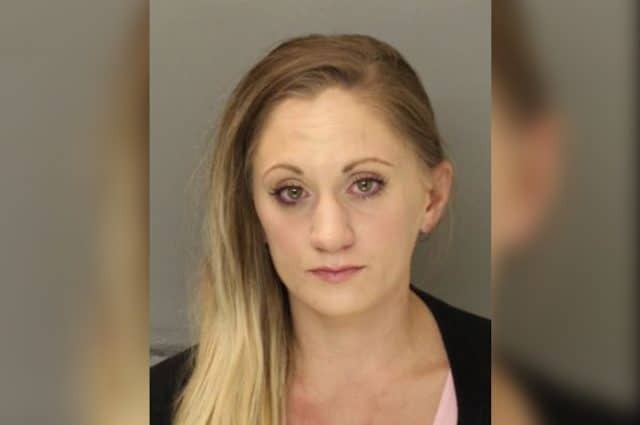 A Philadelphia area mother has been arrested after the self confessed drug addict allegedly transmitted drugs to her 11 week old baby through her breast milk. Charged with criminal homicide is Samantha Whitney Jones, 30 of New Britain Township, Bucks County. The mother’s booking on Friday follows the April 2 death of her infant child, cited as R.J in court papers. The Bucks County District Attorney’s office said the autopsy showed the baby dying after being fed breast milk containing methadone, amphetamine and methamphetamine, Fox 29 Philadelphia reported. According to the affidavit, Samantha Jones told cops she’d been prescribed methadone because of an addiction to painkillers, that she had taken it during her pregnancy and that she was taking it at the time of the baby’s death. Notice of the baby’s death followed authorities finding the baby in cardiac arrest after responding to a 911 call. Jones’ mother called the cops and reportedly tried CPR. The affidavit stated that Jones said she primarily had been breastfeeding the baby, but had switched to formula three days earlier, saying the infant wasn’t getting enough milk from breastfeeding. Jones said that on the morning the child died, the baby was crying at 3 a.m. and she tried to breastfeed him because she was too tired to go downstairs and prepare a bottle of formula. According to cited papers, the mother also said she fed the infant formula at 6 a.m., fell asleep and then woke up to find her son pale, with bloody mucus coming from his nose. Jones was held in lieu of $3 million cash bail. Her 2-year-old son is in the custody of his father. The D.A.’s office said in a news release that Jones’ defense attorney argued for minimal bail saying R.J.’s death was not intentional. Of note, buckscountycouriertimes reported Jones’s arrest coming a year after she was charged with endangering welfare of children and a drug-related DUI. New Britain police alleged in a July 14, 2017, criminal complaint that Jones was spotted the month prior passed out behind the wheel with a baby in the car. A blood test later showed wheel under the influence of the same drugs found in her now-deceased son’s system with the addition of the anxiety medication Clonazepam. The most serious charges in the case were dropped and she was sentenced to a period of house arrest with the condition she continue drug treatment, according to court records. At the time of her 2017 arrest, Jones was pregnant. It remained unclear if the woman attended counseling…. And then there were these comments on the web that made this author wonder, see what you think?